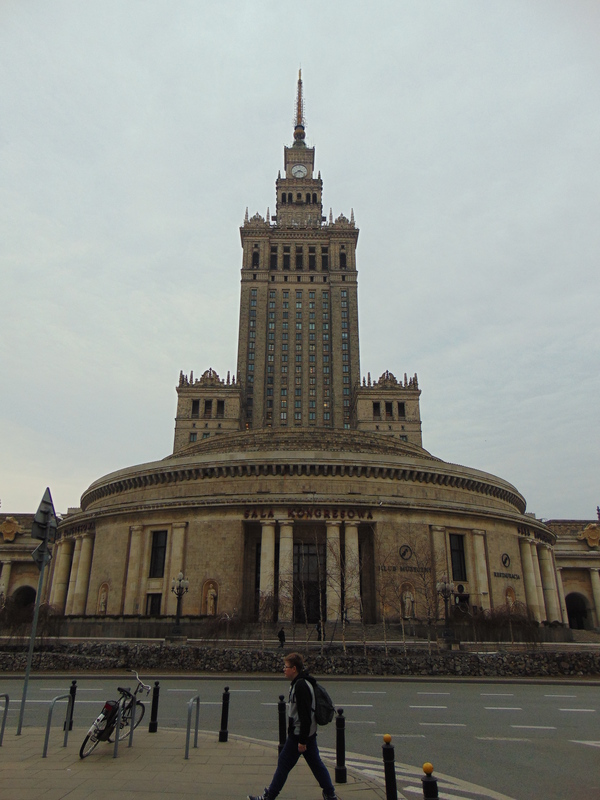 After Krakow, we made our way north to Warsaw. When we stepped off the train, I was a little disappointed to see that the city wasn’t as pretty as Krakow was: this monstrosity/supervillain’s lair was visible from our balcony, surrounded by shiny glass buildings. My dismay only lasted until we found some pretty old buildings (or rebuilt in the old style after the war, anyway) and had some food: for the best vegan food in Poland, I was definitely in the right place. From start to finish, every meal we had was excellent. And there was so much choice. 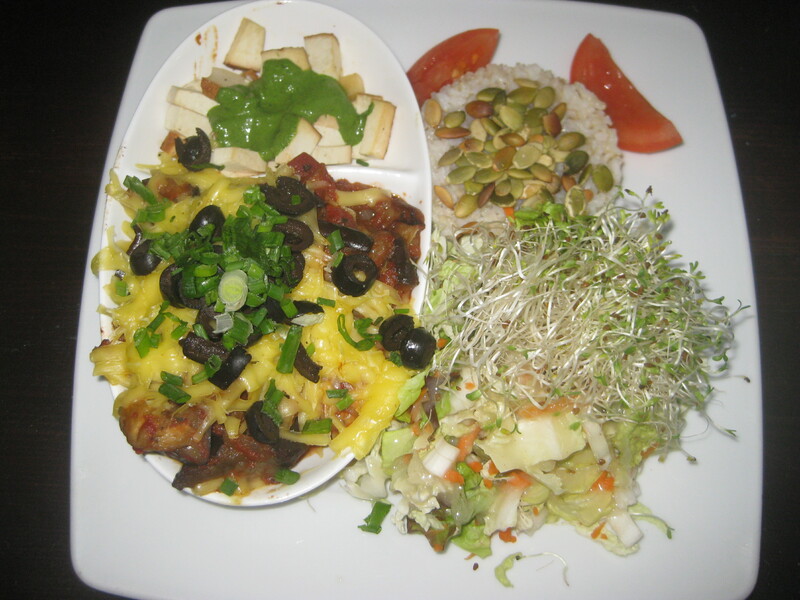 Our first stop was Vege Miasto, an all-vegan restaurant. We were tired after a three hour train ride from Krakow and thought a nice early dinner would help us settle into Warsaw. But at 5pm, this place was absolutely packed – we were lucky to get a table. As such, it was very loud and a little stressful, but it’s still well worth a visit. Like almost every vegan eatery we visited in Poland, it made good use of recycled crates and had floor-to-ceiling windows to create some light. English menus were available at the counter, where you needed to go to order and pay upfront – this is the case in most places in Poland. My first choice dish had already sold out (at 5pm! ), so I went for my second choice: roasted aubergine in tomato sauce with cheese and olives. The aubergine was cooked to perfection, the cheese was melted, it was glorious. But what is all that other stuff on the plate? Sharing the dish with the aubergine are some tofu chunks in a green, gingery sauce. There’s also a pile of rice and some salad. Everything was very good, but they just don’t belong on a plate together. I would have preferred a bigger portion of aubergine with the salad, or pasta instead of rice. As it was, it was just a bit bizarre. Dr HH’s dish was a lot more cohesive. 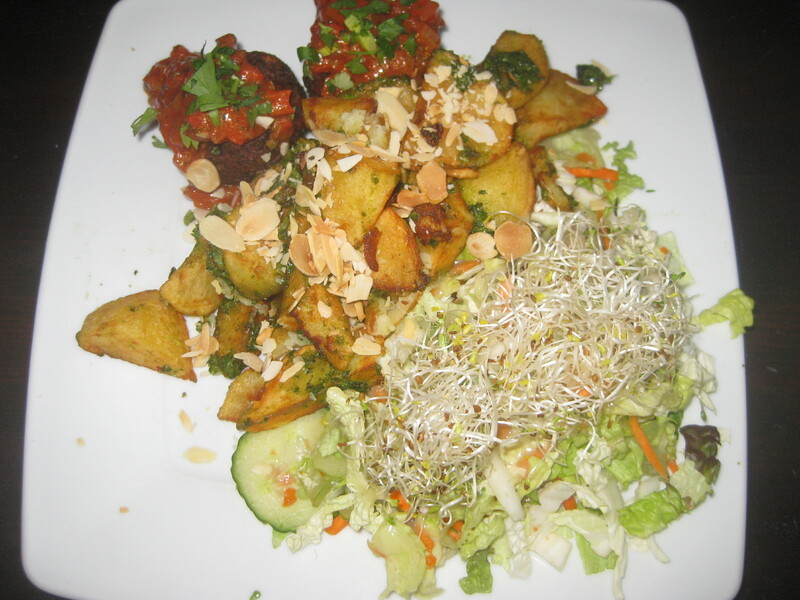 He had sweet koftas (we think it was sweet potato or pumpkin), red peppery salsa, potatoes with parsley pesto and flaked almonds, alongside the salad. He absolutely raved about the flavours, and said everything worked together beautifully. When I ordered at the counter, I of course had a little peek at the cake counter. The whole time we were eating, Dr HH kept an eye on the bounty cake I had told him about, telling me how many slices were left. Fortunately, there was still a slice waiting for me at the end of our meal. 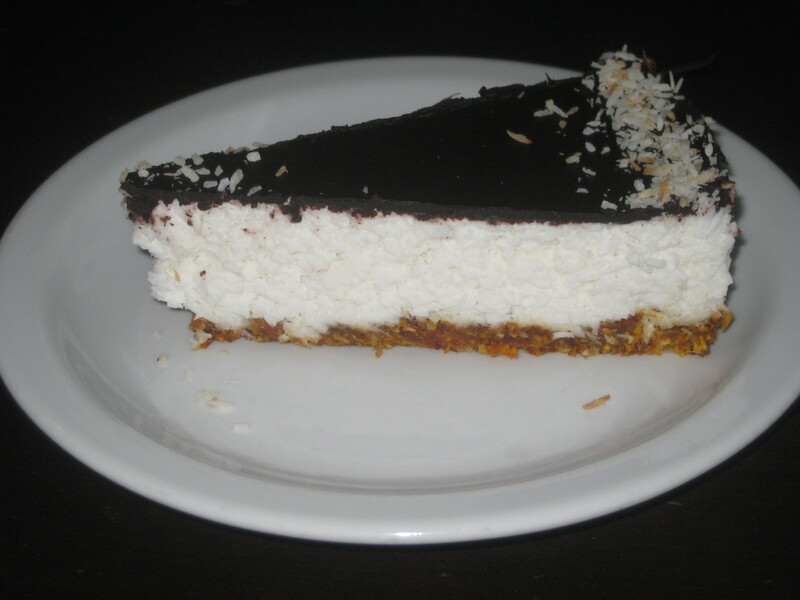 The base was good and crunchy, the coconut layer was beautifully creamy, and there was a layer of decadent dark chocolate on top. It was perfect! 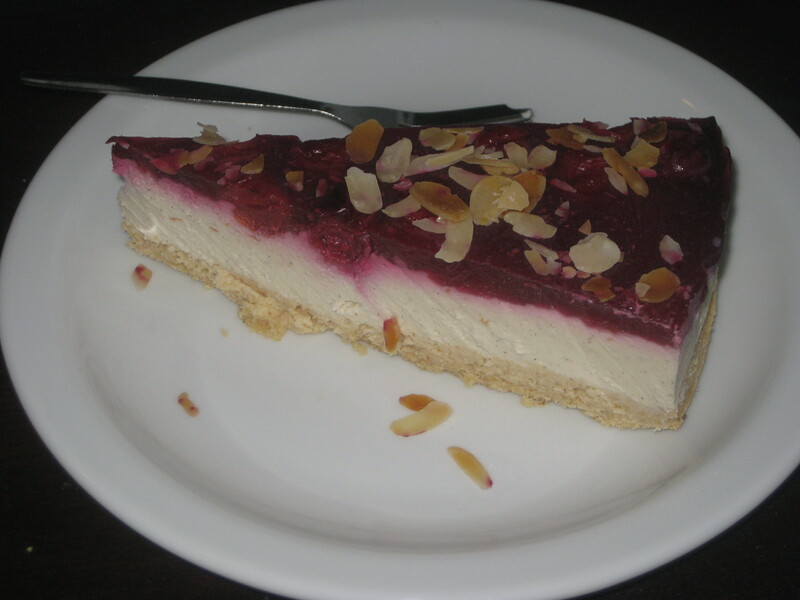 Dr HH had this cheesecake with a pastry base, a creamy vanilla layer and some tart fruit on top. He said it was perfectly balanced. I thought more than once about popping back here for another slice of cake during the holiday, but ultimately I’m glad I didn’t – there were so many amazing things still to come! The next day we got to try some more traditional Polish food. The staff at Lokal Vegan Bistro told us that they change their menu regularly, but the ‘schabowy classic’ is always on there, so that’s what we had. 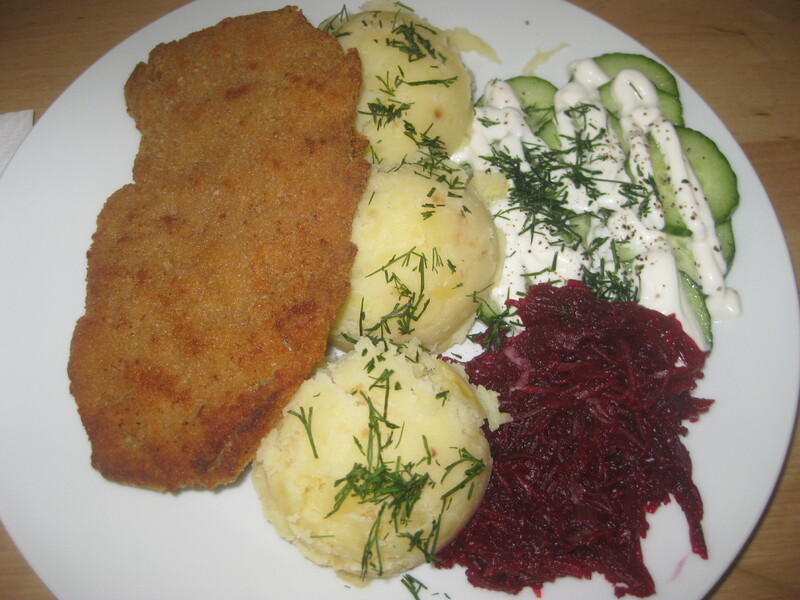 It was essentially a vegan take on meat and potatoes: a juicy, crispy-coated schnitzel, three dollops of smooth mashed potato and some cold salads on the side. At first I was concerned that there would be too much dill (a little goes a long way for me), but actually it was really well-balanced. The steak was the highlight, it was so well-cooked. It was a long time before we were hungry again, but we eventually went to Laflaf for a falafel fix. The menu was a little confusing, but we eventually chose the falafel from the hummus part of the menu. 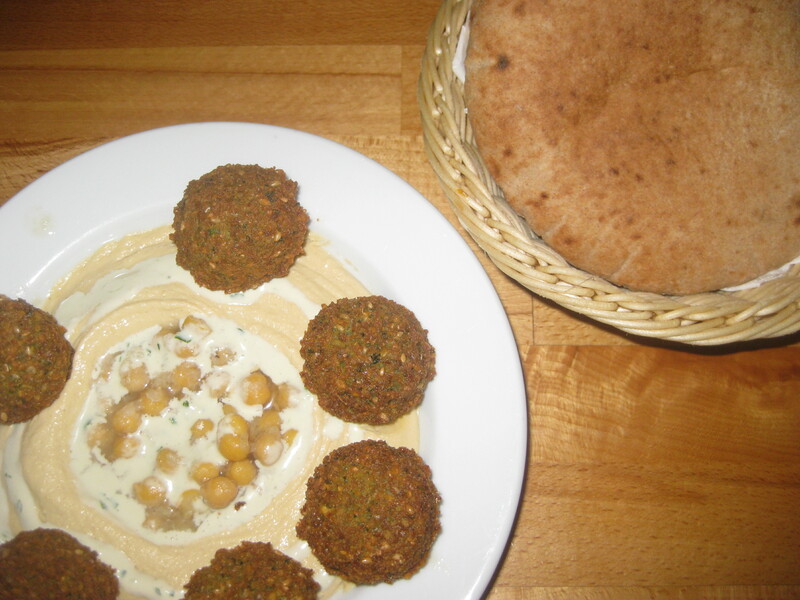 We got a bowl of hummus with tahini and chickpeas in the middle, and six perfect, crunchy, herby falafel balls. There was a choice of white or brown pita, and it was warm and soft. Everything was perfect! 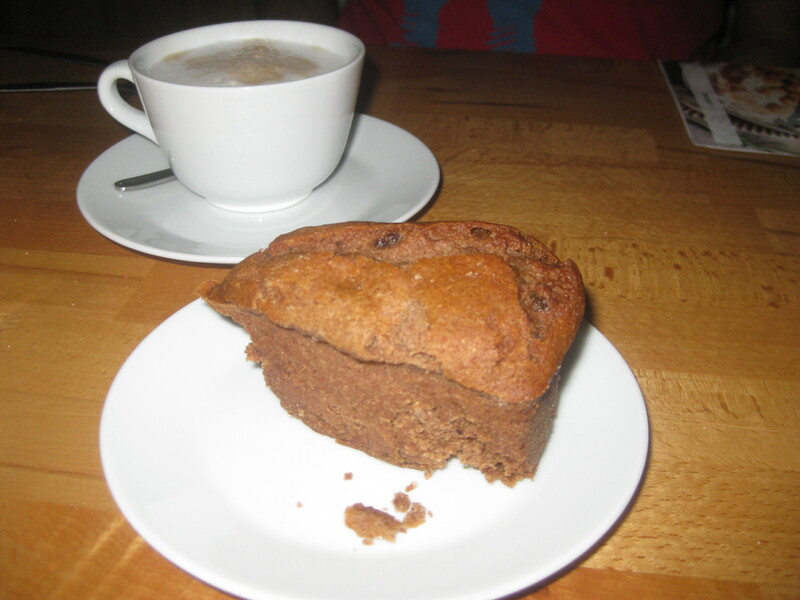 We also shared a slice of tahini cake, just because it’s a bit different. It had nice, festive spices, but it was a little dry, which was a shame. They had a few other cakes as well, and everything’s vegan. We really enjoyed the homemade lemonades here – they had a hint of mint, which was really refreshing. It’s quite a small place but it seemed to do good takeaway trade as well. The staff spoke excellent English, so it’s perfect for a tourist! The next day was my birthday, and my mum had flown over from Manchester to join us for a few days. We went for a birthday sushi feast at Edamame Vegan Sushi and it was spectacular! We arrived at around 12:30pm on a Saturday and were the only customers, which is always a bit worrying – fortunately it was jumping by the time we left. 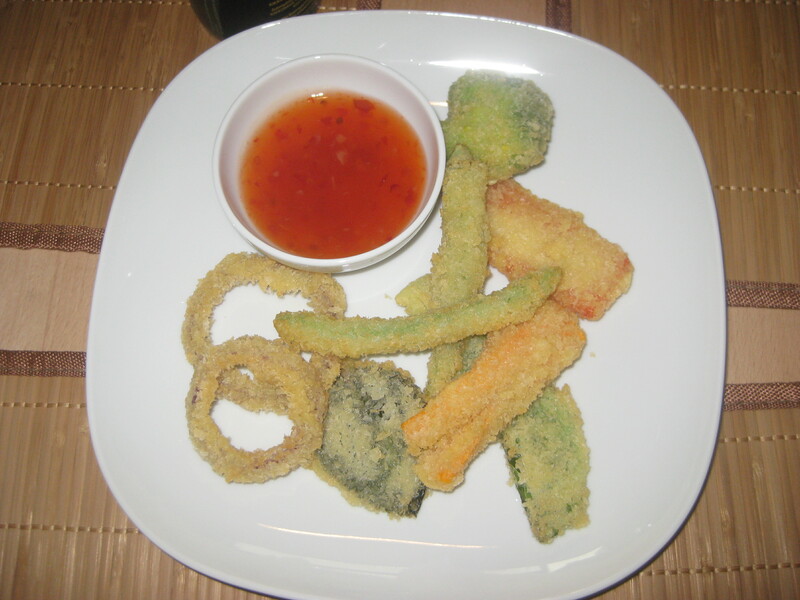 We started with some vegetable tempura, because I can never turn down vegan tempura. The panko coating was so crispy and delicious, and there was a really good assortment of vegetables. And then this plate arrived! On the outside are some tempura rolls. There were a few different options to choose from, and we got the ones with smoked tofu, cucumber, pepper and salad. The smoked tofu was excellent, as expected, and they had such a lovely crunch on the outside. 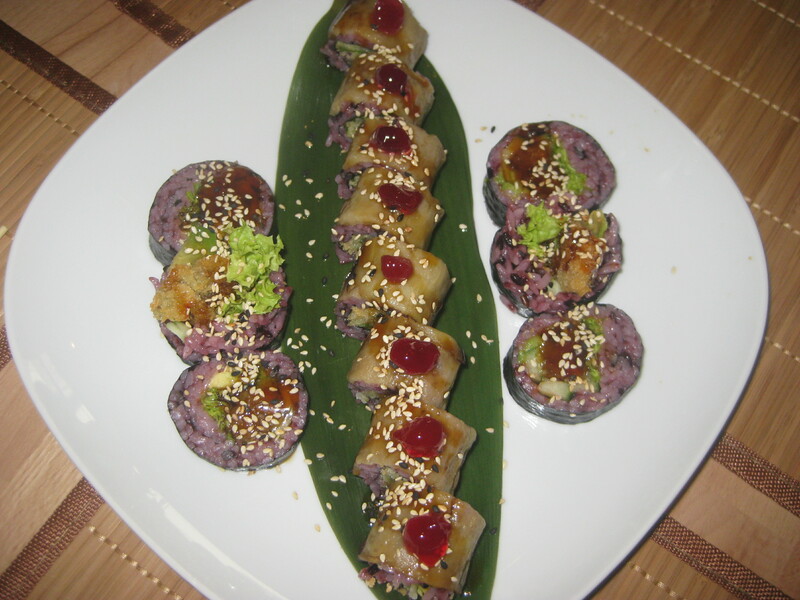 Next are the maki with roasted aubergine, avocado and teriyaki sauce. Usually I think of maki as the boring sushi rolls, but these were really flavoursome and had a good sticky glaze. Delicious! 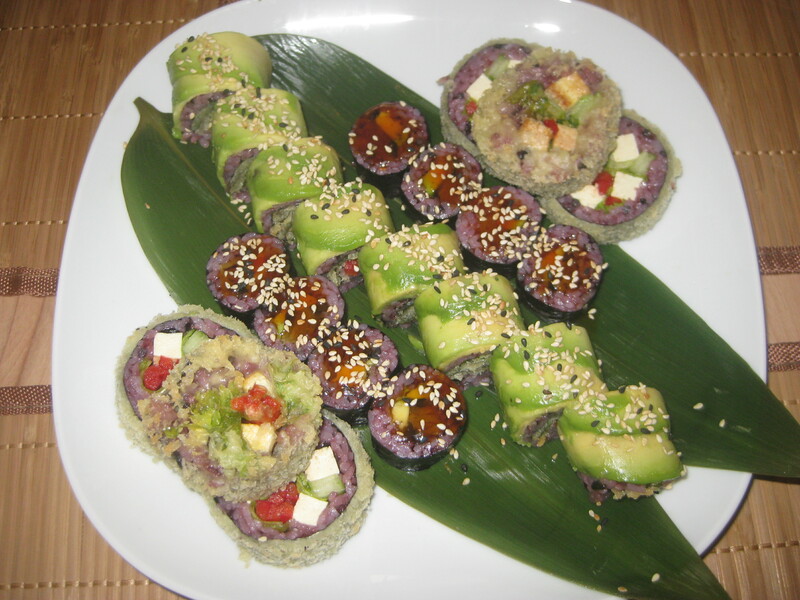 And in the middle are the special rolls: shiso tempura and pepper, wrapped in avocado slices with sesame seeds. It was my first time having sushi rolls that aren’t wrapped in seaweed. The avocado was slippery, but absolutely divine. It was nice having the tempura crunchiness in the middle, rather than all around the outside as in the tempura rolls. We couldn’t stop there, could we?! We got some futomaki with oyster mushroom tempura, cucumber, avocado and teriyaki. This was our only mushroom-based dish, and it was a good choice. And some more special rolls, this time pak choi tempura wrapped in roasted aubergine with teriyaki sauce, sesame and cranberries. They were spectacular! You might think that was us done, but there was banana tempura for dessert and it was my birthday, so what choice did we have? 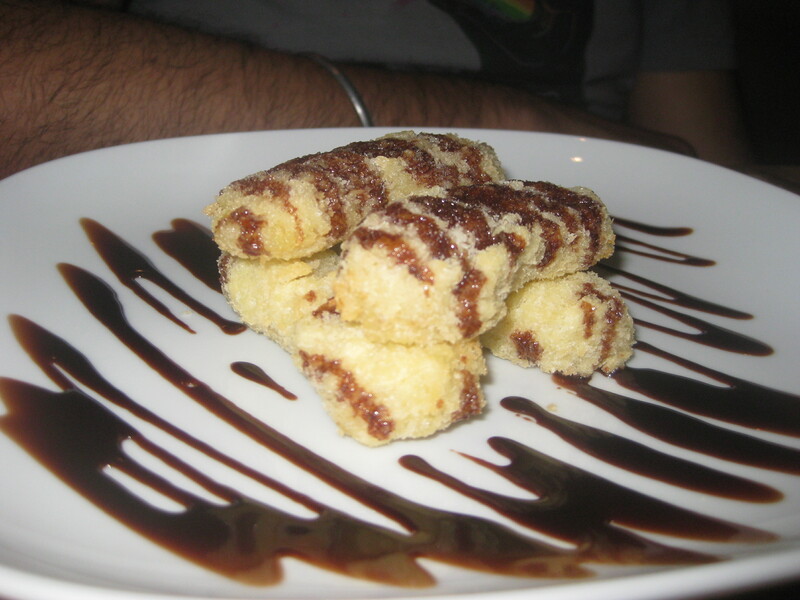 I was expecting one banana, but we got these four pieces, coated in panko and drizzled in delicious chocolate sauce. It was fantastic! I really can’t recommend this place highly enough, it was my favourite spot in Warsaw and easily the best sushi I’ve had. Everything was prepared fresh to order, and the service was really friendly. It was just lovely! There is still more good food to come next week, in the form of breakfast, burritos and burgers. Check back in next Monday for more! 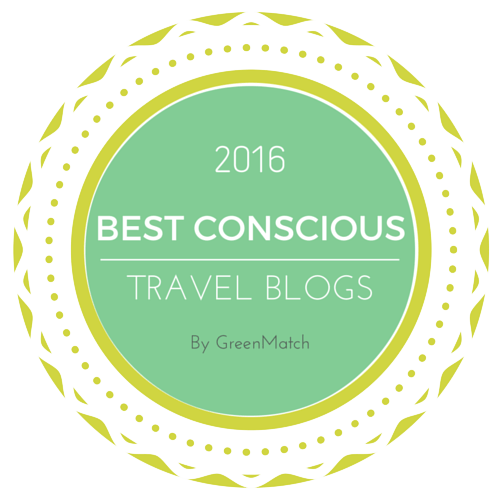 This entry was posted in Travel and tagged Edamame Vegan Sushi Warsaw, Laflaf Warsaw, Lokal Vegan Bistro Warsaw, vegan travel, vegan Warsaw, Vege Miasto Warsaw. Bookmark the permalink. Happy Birthday! All the food looks so good. That bounty (coconut chocolate cake) looks so yummy! Thank you! It was an astonishingly good cake!